The chinese cooking term "Passing through" is a key technique in Shanghai and Szechuan cooking, where the meat is cooked by passing it through hot oil. This step makes chicken breast meat silken, transforms shrimp into toothsome creatures with a firm, almost crunchy texture, and renders paper-thin strips of pork and steak tender and juicy within. In passing through, the food is very briefly cooked in a pool of hot vegetable oil and then removed from the wok. To finish the dish, almost all of the oil is poured off from the wok, and the remaining oil is used to create the sauce. Finally, the passed through food is returned to the wok and stir-fried with the sauce. While passing through is primarily a restaurant technique, it is worthwhile taking the time to master it because no other cooking technique can give the same results. Yes, the food is deep fried, but if it is done properly, it is not unhealthy. First, the food is always coated with a thin batter of egg white and starch, which helps keep the oil from seeping into the food. To prepare for the passing through step in a recipe, place a metal colander on a plate near the stove to hold and drain the fried food. Use a deep-frying thermometer to test the temperature of the oil. Be sure to have a wide wire-mesh strainer for removing the food, and if there is to be a subsequent frying step (as in Crispy Beef), have a fine-mesh strainer handy to skim off any bits of fried batter. Use a large metal wok scoop or spoon to stir the food, as the mesh on the wide strainer could disturb the coating on the meat. Place a large bowl on a heatproof plate nearby to hold the excess oil. Heat the wok for a few minutes over high heat until it is very hot. If you flick water from your fingertips into the wok, the water should sizzle away on contact. Pour in enough vegetable oil to reach at least 1 inch up the sides of the wok - this will be about 4 cups in a 14 inch flat-bottomed wok, there are cases, due to the large quantity of food, use less oil, so that it reaches 1 1/2 inch or 2 inch up the sides of the wok. Don't skimp - any food that sticks out of the hot oil will not cook at the same rate as the rest of the food, and it will get soggy too. But i do skimp, i use 1/2 the amount of oil and cook the meat in small batches. The temperature of the oil is the key to passing through. The oil should be hot enough to cook the food but not hot enough to brown it . 300 f to 325 f(Higher temperatures are reserved for true deep-frying, where the food will develop a crisp golden brown crust.) With the wok preheated, the oil will take only a few minutes to reach the proper temperature. Do not underestimate the value of a deep-frying thermometer. If you don't have one, you can gauge the temperature of the oil with a 1/2 inch cube of white bread: it should take at least a minute to brown in the hot oil. But unless you are an experienced cook, use the thermometer. The protein food(meat, poultry, or seafood) will have been marinated in the egg-white/starch coating. Carefully add the food to the hot oil, one of two pieces at a time, taking care that you don't splash the oil. Add the food quickly, but do not dump everything in at once, and try to keep the pieces as separate as possible so they don't stick together. The food will sink to the bottom of the wok, where the oil around it will bubble, but not furiously. The temperature will drop when the cook food is added, so keep the heat on every high to help the oil return to its original temperature. When all the food has been added, stir the food gently or quickly, depending on the recipe, with the metal scoop(wok chan) to keep the pieces from clinging to each other. Cook until the pieces of chicken, shrimp, or fish turn white on the surface, about 45 seconds, or until pieces of beef or pork turn a light brown (which could take a bit longer, depending on the size of the pieces) Use the strainer to transfer the food to the colander. In most cases, you will now (carefully!!!) pour the hot oil into the large bowl leaving 2 tbsps of the oil in the wok. If you have a subsequent frying step, be sure to heat the oil in the wok to required temperature before continuing. My family calls this dish 'Rusty Nails' cos the fried meat looked like them. Sorry for the lengthy text but it is so important to know. Now for some action. Vegetable oil for "passing through"
To begin the sauce, mix the sugar, vinegar, rice wine, soya sauce, and cornstarch in a small bowl. Set aside. Heat a large wok over high heat. Add enough vegetable to come about 1 1/2 inches up the sides of the wok, and heat it to 375f. Meanwhile, add the cornstarch and egg white to the steak, and mix well to coat the steak with the batter. Add the steak to the oil, one piece at a time so it doesn't splash or stick together, and stir gently until it begins to look crispy, about 1 minute. Using a wide wire-mesh strainer, transfer the steak to a colander to drain. Using a fine-mesh wire strainer, remove any bits of fried batter from the wok. Reheat the oil to 375 f, return the steak to the wok, and fry again until the beef is crispy all over, about 2 minutes. Transfer to a strainer to drain. Remove all but 1 tbsp of the oil from the wok. Return the wok with the oil to high heat, add sliced onions, steak, sugar-vinegar mixture, sesame oil and hot chilli paste(if using). Stir fry until all of the ingredients are well-blended about 30 seconds. Dish out and sprinkle with chopped spring onions. When we eat out, we are sure to end up with alot of french fries not eaten. The fries will be packed home and end up as a dish for tomorrow's dinner. Heat oil and deep fry the julienned strips of crabstick until crispy. Drain and leave aside. Remove all the oil except for 2 tbsp, add in the garam assam paste and saute. Add in the rest of the ingredients and mix well. Adjust taste with salt and sugar. Chrysanthemum flowers is one of the items in my pantry which gets replenished even before the last flower is used up. My generation grew up with this tea but not the younger ones though. Since i got a new jelly mould which is available online from Biodiversityherbs.com, decided to make jelly with chrysantermum tea to entice Renee. To my surprise, she liked these jelly, now i know what to make her when her throat hurts. Chrysanthemum tea has many purported medicinal uses, including an aid in recovery from influenza, acne and as a "cooling" herb. According to traditional Chinese medicine the tisane can aid in the prevention of sore throat and promote the reduction of fever. In Korea, it is known well for its medicinal use for making people more alert and is often used to waken themselves. In western herbal medicine, Chrysanthemum tea is drunk and used as a compress to treat circulatory disorders such as varicose veins and atherosclerosis. Put chrysanthemum flowers in a teapot and pour 250 ml hot boiling water. Put the lid on and let the tea steep for 10 minutes. Strain and leave aside. Reserve the flower for garnishing. Mix konnyaku powder with sugar and stir to mix. Bring 700 ml water to the boil and add in the konnyaku with sugar mixture. Stir until the sugar and konnyaku dissolve. Add in the 250 ml chrysanthemum tea and stir to blend. 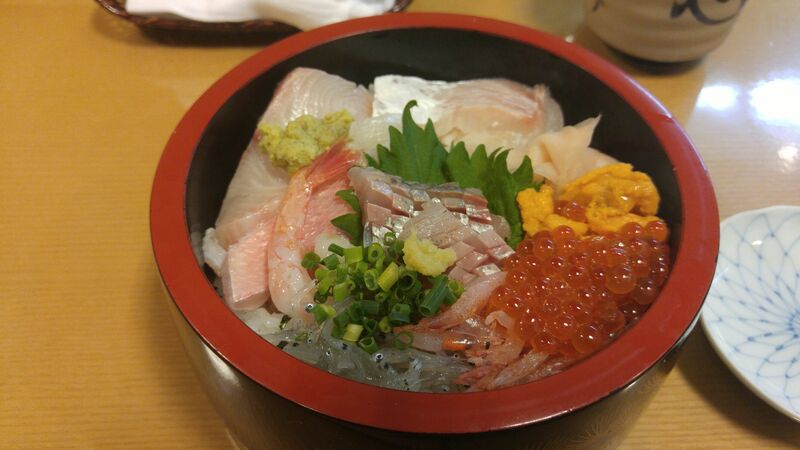 Wet the konnyaku mould with water but do not wipe dry. Put a chrysanthemum flower onto every mould and fill the mould with konnyaku jelly. 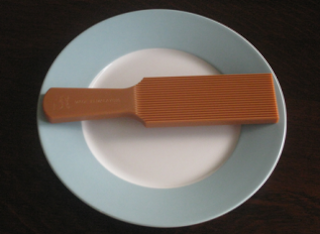 I had dreams of this snack but was unable to make some cos i could not find this utensil. I was elated when Julie Tan from Biodiversityherbs.com wrote to me and said she has baking supplies for sale and i found this so 'hard-to-find' utensil that i longed for in her site. Mix all the ingredients together into a smooth dough and let it rest for at least 1/2 hr. When all the balls are shaped into sea shells. Heat oil in medium heat - 325 f and fry the sea shells until brown and crispy. 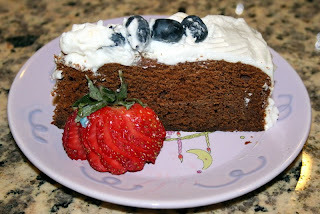 I named this Secretive Cake cos every blogger who made this cake did not share the recipe. There are several names to this cake - Seri Kaya Sarawak Cake, American Midnight Cake and even Kek Belacan. My friends have been giving me recipes on this cake and i have found that the ingredients are pretty much the same and the cake is steamed instead of baked. It has to use a browning sauce to make the cake black. When i got the first recipe, i tried making with gula melaka and it did not turn out black but more like Ma Lai Koh color. Then i made again using coco caramel and mollasses, still not black enough and this time the cake really looked like Belacan. This 3rd trial, i used 2 tbsps of Thick Caramel Sauce from Yuen Chun, longivity brand and the cake is dark enough. Grease a 8 inch round cake pan and line base and sides with baking paper. Allow the baking paper to extend over the top by 1 inch if using the shorter tin. Sieve flour with baking powder. Beat in eggs, one by one, until well combined. Beat in sweetened condensed milk and serikaya until well mixed. Stir in Horlicks until well combined. Fold in sieved flour. Finally stir in vanilla and browning essence. Pour batter into prepared tin. Cover the top loosely with a piece of aluminium foil. Steam over high heat for 30 minutes. Fill up with more hot water if the steamer is low on water after 30 minutes. Turn heat down to medium and steam for another 60 minutes, or until cooked (if you wish to keep cake without refrigeration, then it has to be baked for a longer period, perhaps up to 4 hrs and the cake can last a month). Remember to replenish steamer with hot water whenever it is drying up. This cake has never failed me, I am getting better in making it. This time, i made double the amount of Ganache, which made it easier without having to stinge on the filling and there was enough to cover the whole cake with ease. In the good old days, chicken dishes were only served during the festivals but nowadays, we have chicken practically every other day. I am running out of ways to cook with it. Luckily, the family likes this dish and it has been my 'lifeline'. In fact this is a confinement dish cooked with sesame oil and lots more ginger slices. Heat wok/skillet with 1 tbsp oil and brown the chicken pieces. Remove and leave aside. Add in the other tablespoon oil and fry the ginger slices until golden brown and fragrant. Put the browned chicken pieces to the ginger slices and add in stock/water, light and dark soya sauce. Cover the wok/skillet and let the chicken cook through. Remove lid and cook until the sauce is thickened. You will never imagine that this Beauty is made with black glutinous rice flour. I did not know that glutinous rice flour can be used for cakes. i was quite scheptical that the cake will turn out chewy and sticky like Nin Koh but it was quite the contrary, the cake was soft , moist, fragrant and had the most unusual color. It was not black but a purplelish grey which can throw you off at first sight but the taste was fantastic. Whisk eggs, sugar and ovalette together until fluffy and white. Add black glutinous flour, vegetable oil and coconut milk, continue to whisk until ribbon stage. 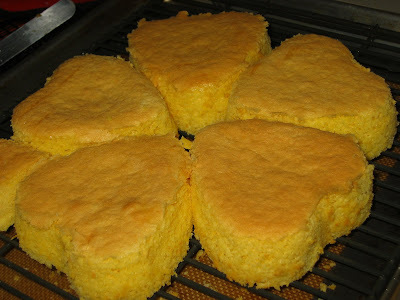 Remove from steamer and after 5 minutes, remove cake from pan and let it cool before serving. Rowntree fruit gum, barley sugar, butterscotch or Murray Mints are some of the English sweets when i was growing up, but this Coconut Candy is THE One And Only candy which is not imported and so is made with local ingredients that are readily available in Malaysia. It was and still is wrapped with lovely colored cellophane. Crush palm sugar into smaller pieces and put the rest of the ingredient in a heavy based saucepan. (I like to put the saucepan over a cast-ironed skillet). Cook on medium heat, stirring until the palm sugar and sugar is melted. Do not stir and cook until it is 257 f - the hard ball stage. To test , drop a blob into cold water. It should harden. Pour the mixture onto a greased silicone mat. Using the plastic spatula, stir to cool the mixture slightly, then divide mixture into 4 portions. Roll each portion into a long, 1/2 inch thick roll, then cut into 1 inch lengths while it is still warm. Shape the edges and wrap in cellophane. 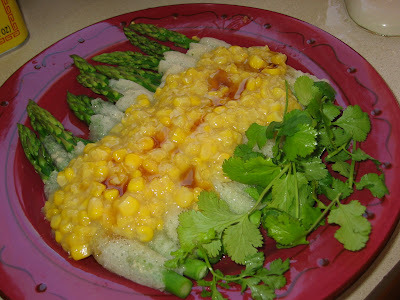 The earthy flavour of the bamboo pith stuffed with crunchy asparagus and top with creamed corn sauce is healthy and nutritious. Soak the bamboo pith until soften. Cut off both edges, rinse and drain dry. Remove the woody ends from asparagus. Pass asparagus through a bamboo pith, repeat process and then steam the stuffed bamboo pith for 10 minutes. Put creamed corn and stock in a saucepan and bring to the boil. Pour over the steamed bamboo pith and sprinkle with sesame oil before serving hot. These famous buns were born in Hong Kong but is loved world-wide. They are irresistable as they are sweet, buttery, coconuty(if there is such a word), soft especially when the dough is made using the Tangzhong starter/Water roux. Add dough ingredients (a) and (b) in a mixing bowl. Mix with dough hook at slow speed for 1 minute. Change to the medium speed, and continue to mix on slow speed for 3 minutes on medium speed until a dough is form. Add butter gradually and mix for approx. 5 minutes on medium speed until gluten is fully developed, i. e. elastic, smooth, non-sticky and leave from sides of mixing bowl. Leave in a warm place until dough is double in volume. Alternatively use the breadmachine - put ingredients b: first, follow by ingredients a:. choose the dough function. When a dough is formed, add in the butter and let the dough function complete the cycle. Punch the dough down to release gases produced in the fermenting process. Divide dough into 6 even portions and round up. Rest for 10 minutes. Beat butter and sugar of the filling ingredients until creamy, blend in pudding powder and coconut shreds. Mix 2 kinds grease from the topping and then sift in the confectioner's/icing sugar. Combine well. Gradually add in egg and salt. Beat until well-combined. Sift cake flour into the mixture. Blend. Place the whole mixture in a pastry bag. Press each portion into a round and place some stuffing in the middle of dough, seal the edge and shape each into the long shaped bun. Pipe the topping and drizzle the top with sesame seeds. Cream butter with sugar until fluffy, then add in the rest of the ingredients. Blend thoroughly. Angie's Recipe and Cornercafe are my favorite bloggers, who have shared so many of their experience on bread-making. This Water Roux is something new to me and thanks to them and so many other bloggers, i have made successful bread using it. Thank you Angie and Seadragon for sharing and not forgetting all the other bloggers who shared too. A Tangzhong starter / Water roux starter is a mixture of flour and water. That is to combine together one portion of bread flour and five portions of water by weight in a pot. I have made Cocktail buns using it and they are the best soft buns, forget about it in the Dum Sum restaurant and make some following the recipe which i will post tomorrow. In a bowl, whisk together the water and the flour until the mixture is well blended and lump free. Remove from heat and cover loosely with plastic wrap to prevent from drying. Store the starter in the refrigerator after completely cooling down. To use the starter, measure out the amount called for in a recipe and let it warm to room temperature. Unlike sourdough starter, this special Tangzhong starter doesn't improve its flavour with age. So it's preferably to use up in 3 days. Instead of the dependable potato side-dish, i decided to bake sweet potatoes instead. The baked sweet potato wedges turned out really well. They were not as crisp as the fried fries but they were slightly crisp and the insides were nice , soft and sweet . Lightly spray nonstick baking dish or cast-iron skillet with cooking spray. Spray potato wedges with cooking spray and toss together with all spices in a bowl. Place potatoes in a single layer in the baking dish or skillet. I had intended to bake for Valentine's Day, but somehow did not find the time until the event is over until the weekend. Since the occasion is over, there is no need to make a red cake, so made these chiffon with orange concentrate and they were a winner. Mix (A) till well blended. Whisk egg whites in (B) till foamy then add cream of tartar. Continue to whip till soft peak, then add the sugar gradually. Whisk until thick and glossy. Add 1/3 of the egg whites into (A) till well combined, then fold in the rest of the egg whites as gently as possible . Pour into the heart moulds. Bake at 350 f for 20 minutes or until done. 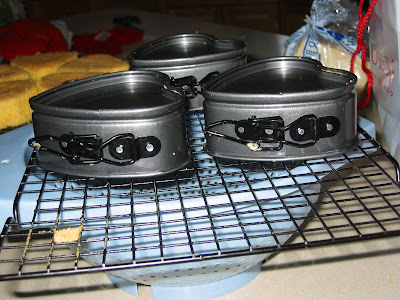 Remove from oven and immediately invert cakes onto a cake rack which is sitting on a colander. Let cakes cool before removing from heart moulds. Nuke the first 3 ingredients in the microwave for 1 1/2 minutes, stir until all the ingredients are dissolved. Add in the rest of the water and pour into heart moulds. Leave in the fridge to harden.